Editing is such a long and painful process that anything that makes it more bearable is very welcome to me! 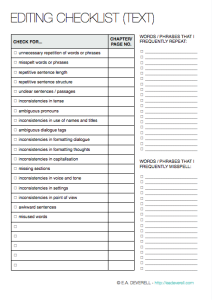 I designed this checklist to help you break down the steps of polishing your manuscript mess, or if you wish, to send to beta readers to give them some ideas of what to look out for. It’s particularly helpful if you keep a running list of words / phrases that you frequently misuse, misspell or repeat, so that you can refer back to them each time you start the final edits of a manuscript. Good luck! P.S. 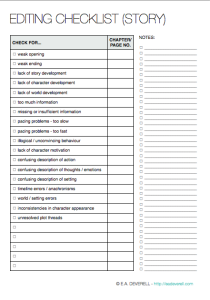 You can use the dialogue worksheet for a more detailed audit of your characters’ conversations.